There’s a perennial debate about the effectiveness of negative or attack advertisements in political campaigns. Some — such as Alan Grayson’s “Taliban Dan” ad — are so outrageous, so over the top, so demonstrably false that they redound to the benefit of the candidate on the receiving end of the attack. And yet in this election cycle, lethally effective. In many corners of the country, “voted with Nancy Pelosi” might just as well be synonymous with “Incumbent X soul sold his to Satan, and we have the documents to prove it.” I don’t think the Democrat power players who put Pelosi in the Speaker’s chair have realized — or indeed are capable of understanding — that to most people who pay attention, Pelosi represents most of what is wrong with the Left in America. There are reasons that Jeanne Kirkpatrick’s famous 1984 constructions — “San Francisco Democrats” who routinely “blame America first” — ring so true. Pelosi is merely the current most visible exemplar. 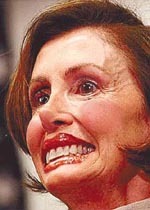 Ace of Spades HQ routinely refers to her as “Granny Rictus McBotox.” (I think I got that right.) Me, I think she’s got the “Speaker Sardonicus” thing going on. Sweet Sardonicus reference. I remember watching that and being scared witless. Kind of like when Pelosi became Speaker.